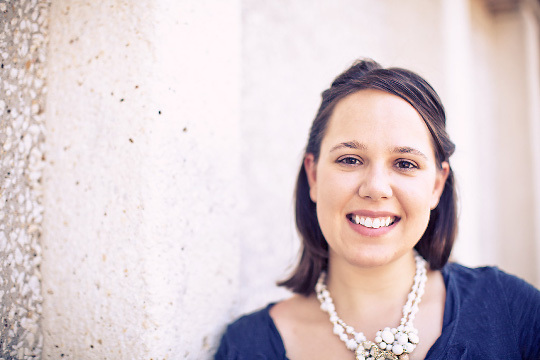 Last year I had the pleasure to work with Rebecca on addressing her wedding invitations. These were designed by Delphine and are they not superb? I love the color and details. As someone familiar with letterpress – the registration is perfect between colors. These are still some of my favorite invitations. 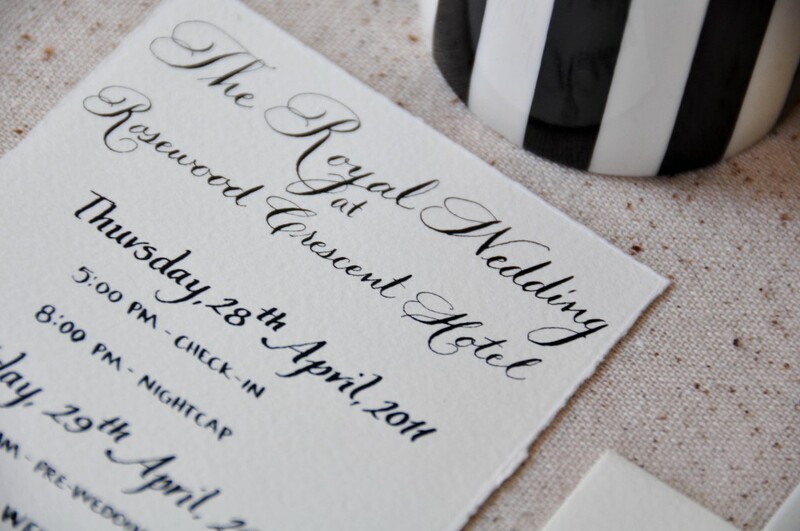 We used the zanner font in a walnut brown ink for the calligraphy. 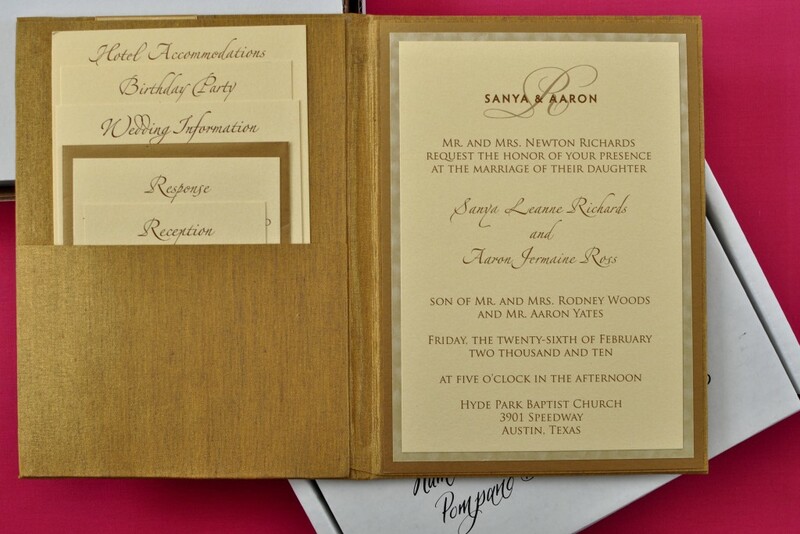 Last Year Sanya and Aaron had an amazing wedding in Austin at The Four Seasons. 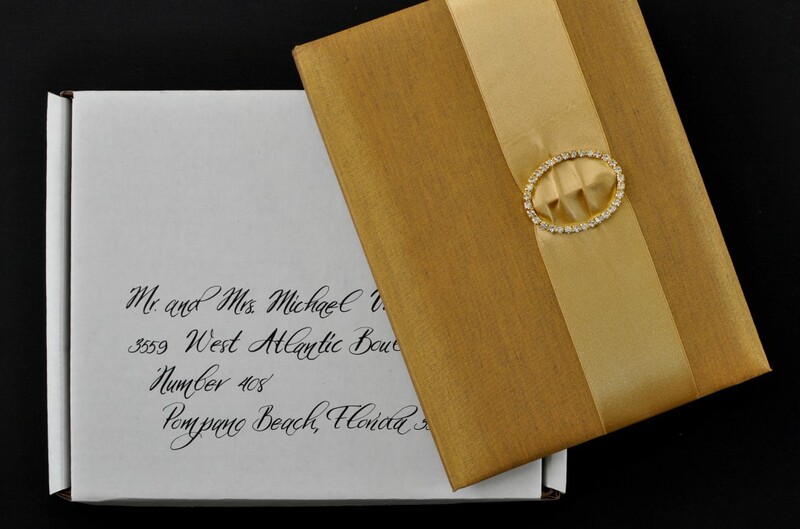 Donnie Brown was the planner and you can see video from the event on Platinum Weddings. 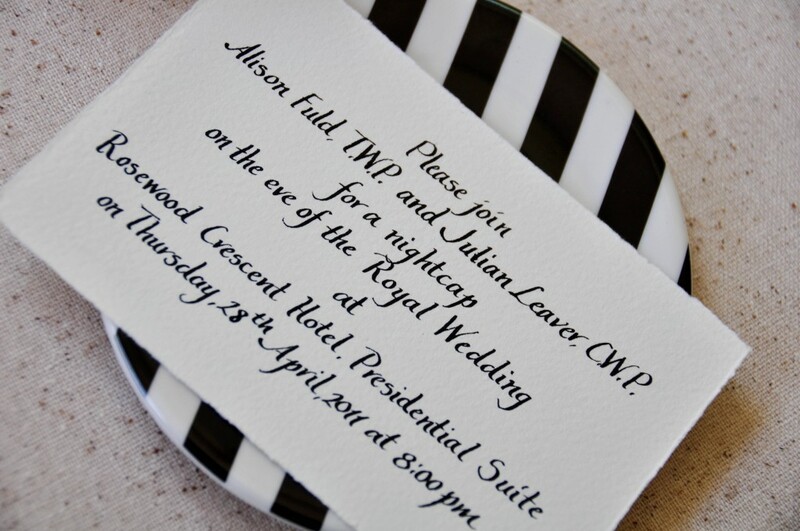 I was pleased to be asked to be the calligrapher for the invitations (designed by the talented Hollye with Carta Creations!). 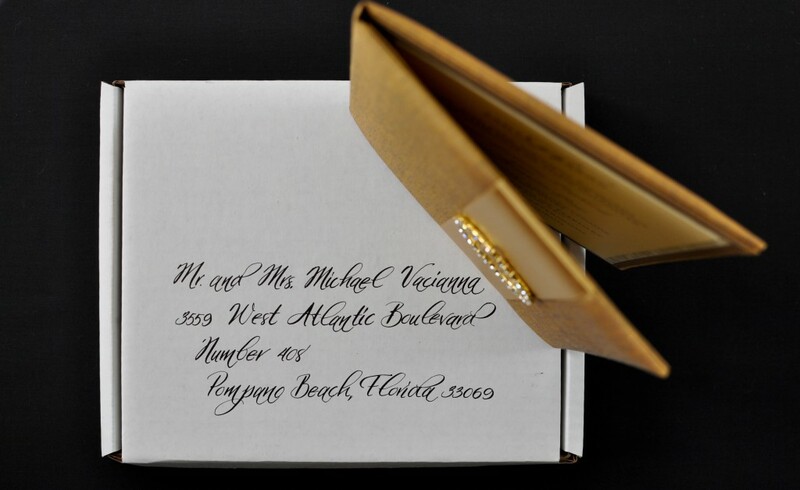 We used black ink in the calligraphy kegan font style on shipping boxes to house the silk covered invitations. You can see how substantial they are in the photo below. Everything was situated on a bed of pink tissue. 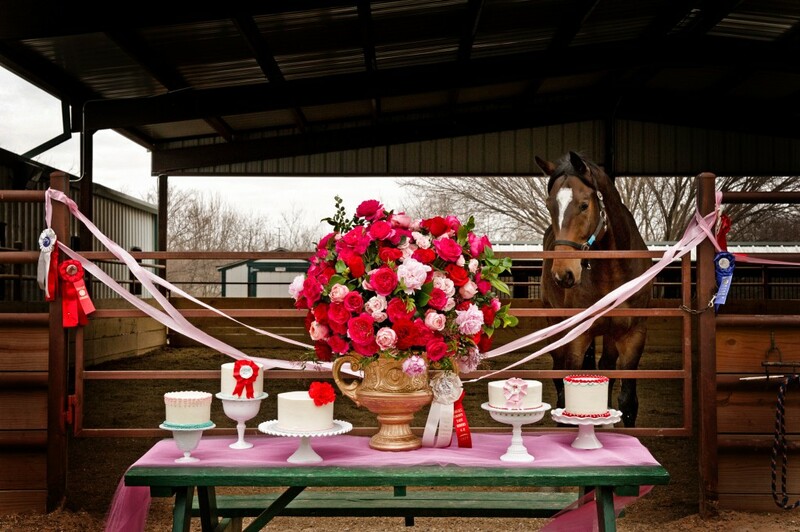 Today a derby inspired photo-shoot with some fabulous vendors was featured on Style Me Pretty Texas! Check out their full post here. Working with a great team really helps the color and fun of this inspiration translate into real life. Bows and Arrows designed the lovely floral, Greg Bloomberg Photography captured the wonderful photos. Sugar Bee Sweets mastered the lovely cake table and James with Pure Vida Salon rocked the hair and makeup on our models. 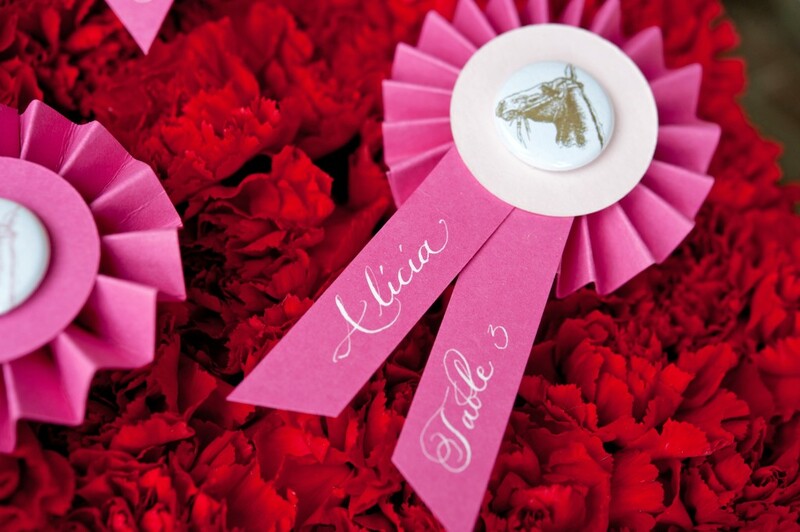 Jason from Missing Q Press is a creative genius and made these cute paper ribbons that I added my calligraphy to. 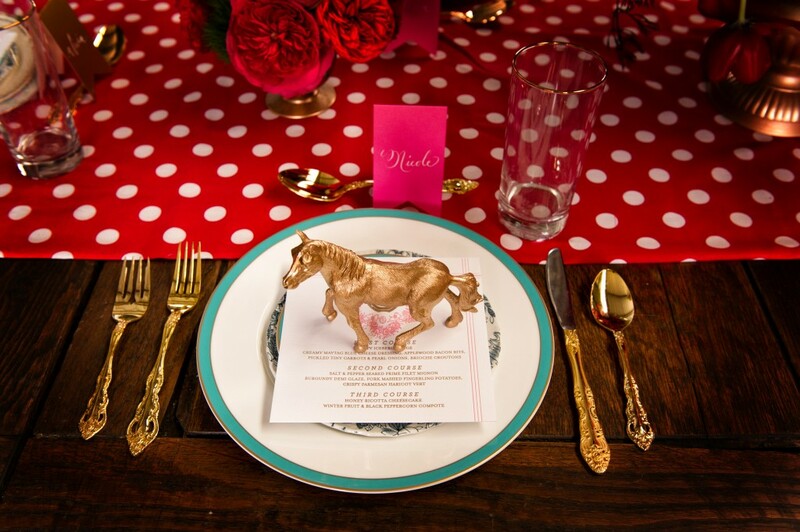 I am also loving the stunning menu’s and darling gold horses that topped the eclectic table settings. 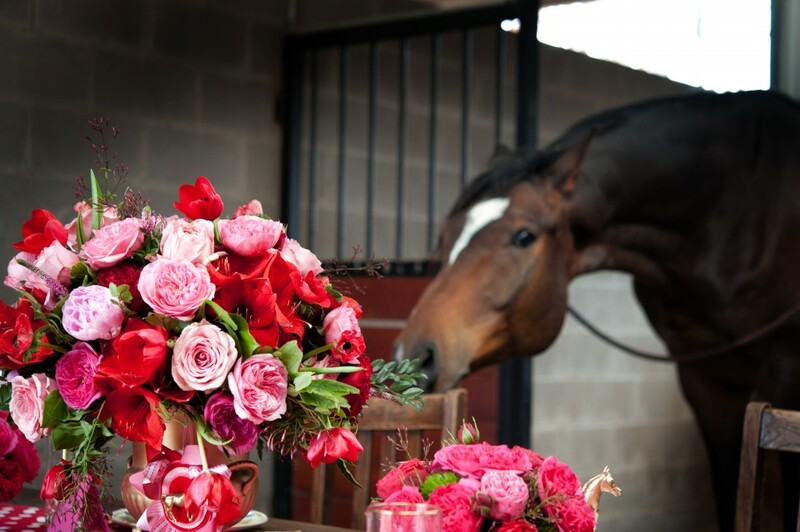 Everything really came together at the Rocking M Stables in Dallas where our horse was hamming it up for the camera. *no animals were harmed during the execution of this shoot. While the Kentucky derby was a week ago, we think you could pull off a great Belmont party instead (or translate to a chic baby shower)! This is my final royal wedding post! 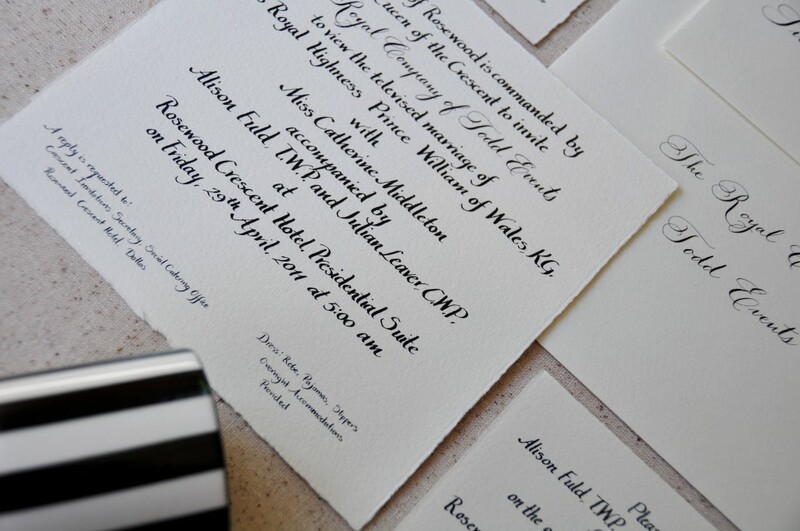 I just had to share these lovely all hand calligraphy invitations I pulled together for my friends at the Rosewood Crescent Hotel in Dallas. They hosted a few local planners from Todd Events to watch the royal wedding and made it into a little slumber party filled with a nightcap and early morning breakfast. 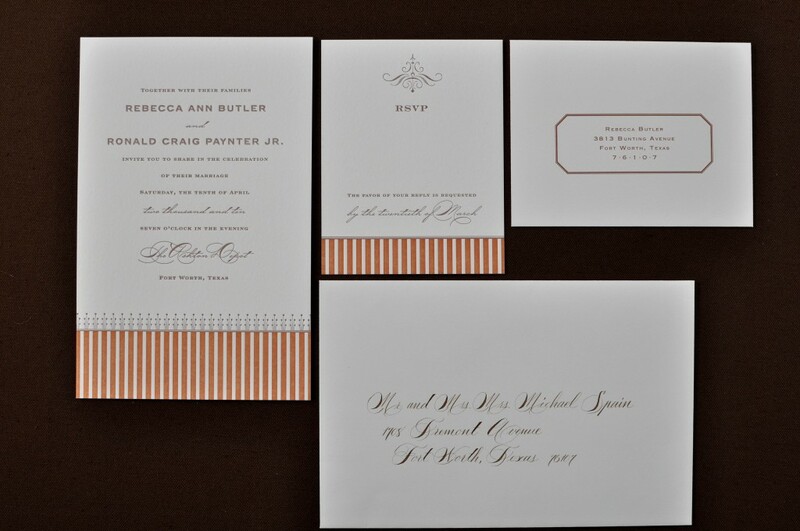 The pieces included the invitation, schedule of events, nightcap invitation and 2 envelopes all on lovely Arturo Italian papers from Paper and Chocolate. Majority of the lettering was italic in black ink. Since I just love the pointed pen I could not resist inclusion of the lovely rook font on the pieces for the touch of lovely. Did anyone out there host a Royal Wedding Watching Party? What did you do to celebrate? Happy Monday all! 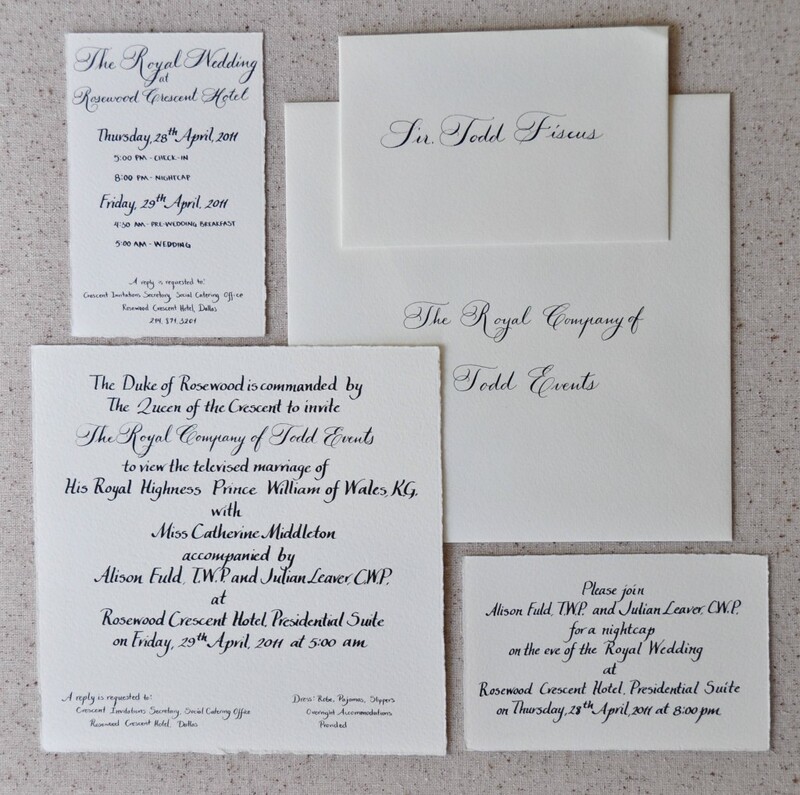 Last Friday was the lovely wedding of Prince William and Kate Middleton… now the Duke and Duchess of Cambridge! I did not get a chance to post a recap with all the work we have around here… to today it is! It was so much fun getting up early and interacting with my friends on twitter while watching the wedding on youtube.com. Did you watch on the television or internet? – I’m curious because it seemed like I was one of the only ones watching it live via the internet. My favorite wedding day features were the tradition and sentimental value everything had. And that almost everything was locally source in Britain. I, of course, adored the dress. McQueen has always been a favorite designer of mine and I am so proud of Kate for channeling the classic beauty of a conservative but graceful wedding dress. Similar to that of Grace Kelly. But the best part was that the fabric and lace (with a small French chantilly exception) was British. The pattern had a meaning, the tiara was from the Queen Mother, the shoes were also handmade by the Royal School of Needlework and the earrings were a gift from her parents with the gilded acorn in honor of her new crest. The trees and flowers were stunning. The cake was breath-taking. The hats were amazing (I have quite a collection & was tempted to wear one out on Saturday!) And the love was apparent. Good Wedding.